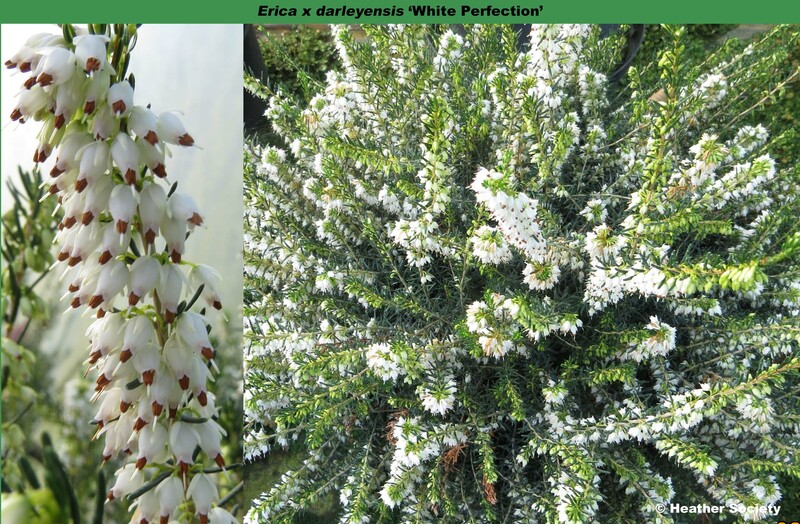 Erica x darleyensis is a hybrid between winter heath (Erica carnea) and Irish heath (Erica erigena); the original was found in a nursery in Darley Dale, Derbyshire, in the late nineteenth century. Numerous seedlings have been raised in recent years in deliberate breedings programmes. Fully hardy, and one of the easiest heathers to grow, being suitable for all soils and is particularly good at smothering weeds. The cultivars have a long flowering period and often exhibit coloured young shoots. It is hardy to zone 7. A good addition to brighten your winter beds! 'White Perfection' has bright green foliage, the young shoots tipped yellow in spring; erect; height 31–45cm; spread 61–75cm. Outstanding – best of the white Darley Dale heaths.